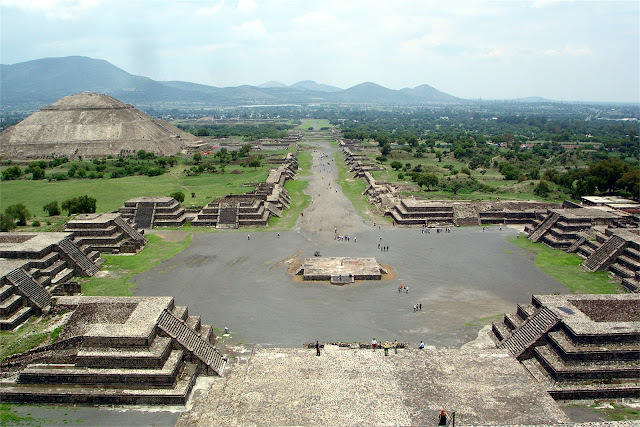 About thirty miles northeast from Mexico City lies the archaeological site of Teotihuacan. 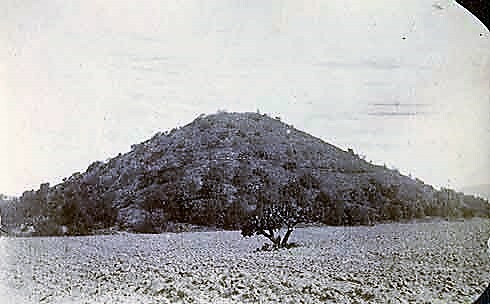 Largest of the pyramids at Teotihuacan, before excavations began at the turn of the century. It is significant to note that the gigantic pyramids at this ancient site were originally covered with as much as twelve feet of soil. This made them look like the giant features that we have called the Bosnian Pyramids and have spoken about on another of these blog entries. 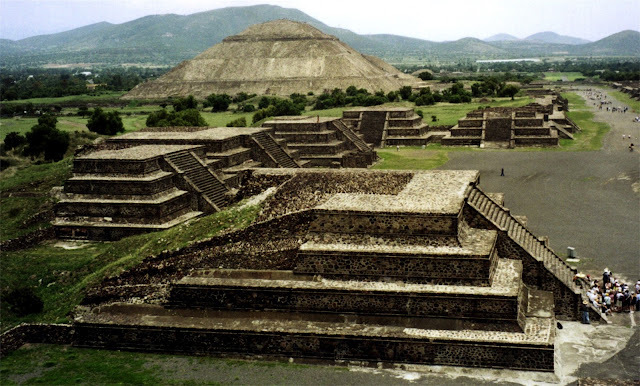 This particular pyramid in Teotihuacan is 216 feet tall, so the first question is, "What possible natural process could have deposited 12 feet of soil on a structure 216 feet above the surrounding plain." Wind or storms could not have deposited that amount of material up there. The only believable scenario is an event like the Great Flood, where deep water submerged the entire structure for a long amount of time, depositing sediments in the process. It is regrettable that those sediments are no longer available for analysis, to determine if they were water borne. I feel sure of what the answer would be. 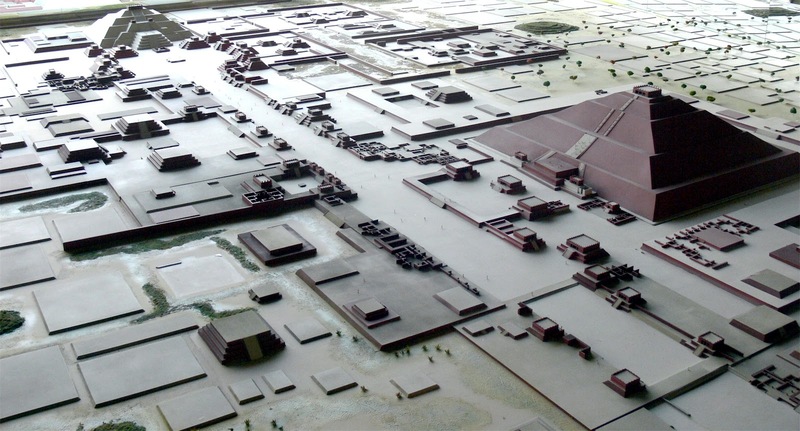 This is an archaeologist's scale model of Teotihuacan at it's height. The site is still massive, but only a fraction as big as the city was at it's peak. 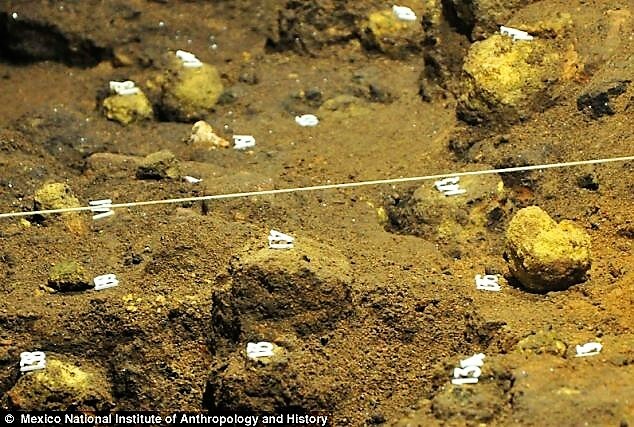 Archaeologists guess that they have only uncovered about 10% of the total area of the city and that the population climaxed at 150,000 to 200,000 and a total area of 8 square miles. They think that the city was founded around 100 B.C. and was abandoned around 600 to 700 A.D. It is worth noting, though, that (as we have said before), the stone structures of the city cannot be dated. They can only date organic samples of things that are nearby - plants, food, human and animal remains - things that could have been brought to the site much later. 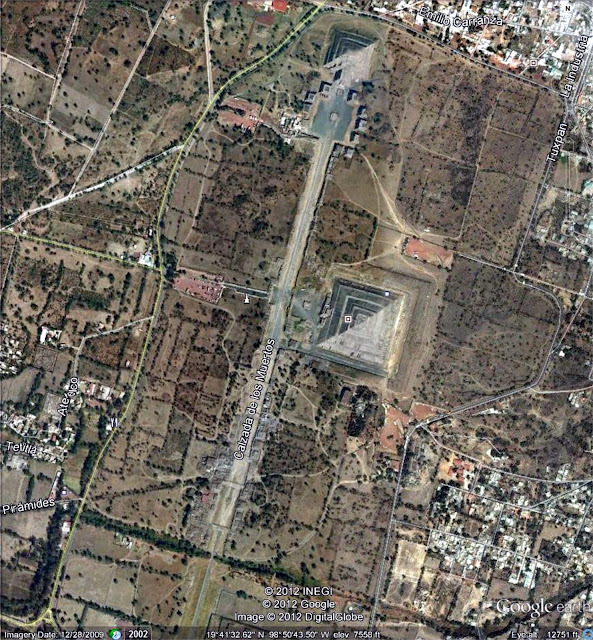 What is still visible of Teotihuacan is impressive enough. The main street-like structure, called "The Avenue of the Dead," is 131 feet wide and 3 miles long. 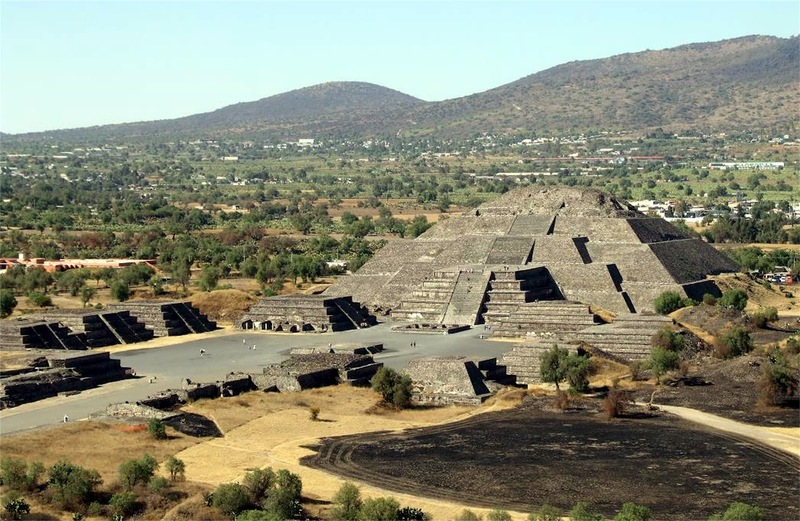 It connects three main pyramidal structures (called "the Pyramid of the Sun," "the Pyramid of the Moon" and "the Citadel"), with dozens of other smaller structures in between. 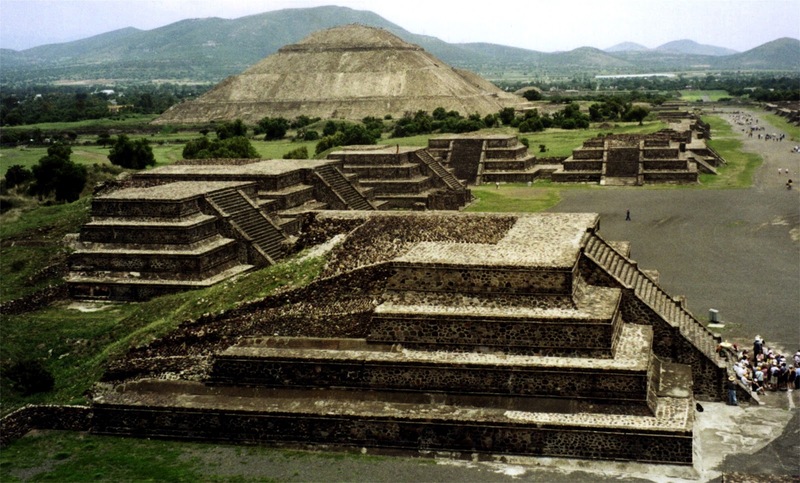 Just to produce the Pyramid of the Sun alone required a million cubic yards of various stone materials. That is 2 million tons. It is 216 feet high and sits on a base of 720 x 760 feet (almost exactly the footprint of the Great Pyramid in Egypt). 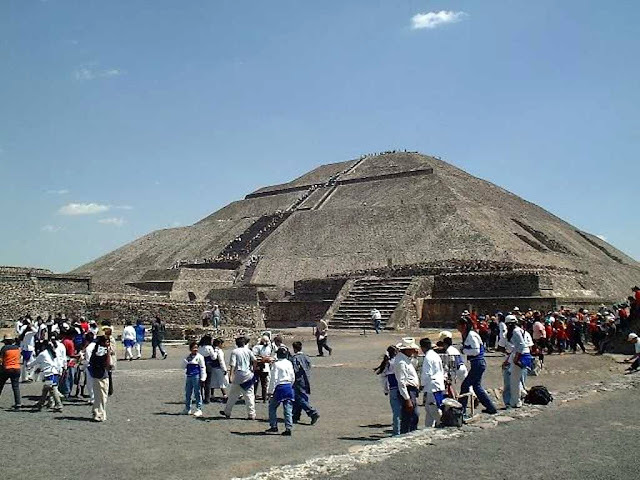 The smaller Pyramid of the Moon took 1.5 million tons. Together, it is estimated that it would have taken 15,000 men 30 years to build these two structures alone. Additionally, in the case of the larger temples, there were as many as five versions of the temple, one built on top of another. Interestingly, the earliest versions have stone work that is megalithic in size (blocks of two to ten tons), squared off and completely flattened on all six sides. The later layers have irregular stones just glued together with cement. This is very like the pyramids of Egypt, in which the oldest pyramids show the more excellent stonework. Curiously, although the later Mesoamerican cultures used a hieroglyphic form of writing which they covered all of their monuments and buildings with, Teotihuacan has no evidence of any writing, anywhere. Again, I could note that earlier people, with superior memories and communication, had little or no need for writing. 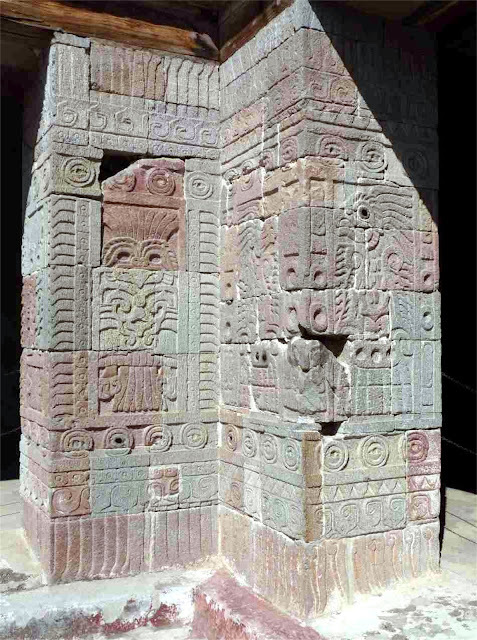 We have seen this before with the Puma Punku and Tiawanaku sites in South America, as well as the Indus River sites in Pakistan or India, noted on other blog entries. 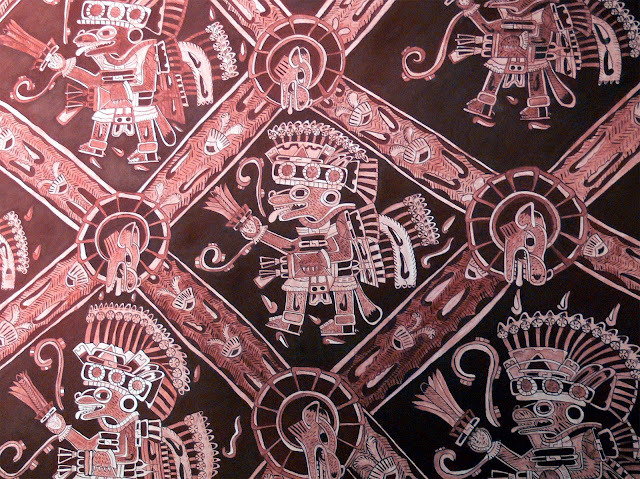 By the time the Aztecs wandered into the city, hundreds of years later, it was ancient and anciently abandoned. No one knew, by then, who built this city, what their names were, what the city was called or why they left. 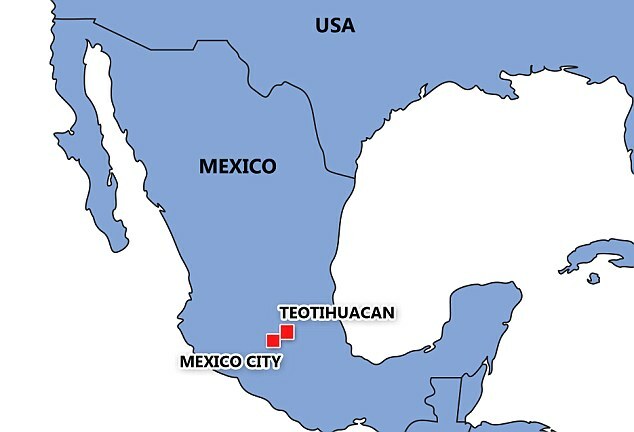 Even the name of the city, "Teotihuacan," is in the Aztec language of Nahuatl. It means, according to one expert (Thelma Sullivan), "the place of those who have the road of the gods," or "the place where men became gods" in another translation. Subsequently, the Aztecs started naming things for themselves, but with no idea about the significance of anything they saw. For instance, they called the largest pyramid "The Temple of the Sun," because that was their chief deity and they would have built the largest temple to him, so they assumed that their predecessors would have done the same. They called the main thoroughfare "The Avenue of the Dead" because they thought that the structures lining the street were tombs. Calling it an "Avenue" may be a misnomer as well. The "street" is interrupted frequently with partitions about 10 feet in height. These structures have led some theorists to believe that the entire "Avenue" was flooded with water at one point and that these partitions were bridges. This idea is supported by the fact that the partitions have very robust water sluices located beneath them. In addition, the Temple of the Sun was built centered over a natural cave that was expanded into the shape of a four leaf clover. This cave also is equipped with well-constructed water channels although there is currently no need for such a large drainage system. This cave was filled with carvings and offerings of various kinds, so it was obviously of some importance, warranting the protection of the water channels. 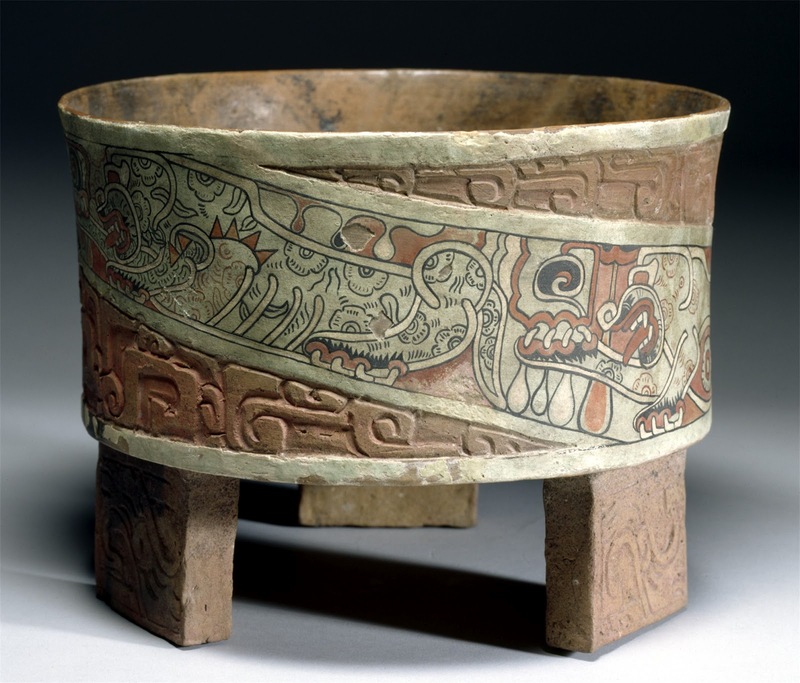 The artwork of Teotihuacan is distinctive and obviously foundational to the artwork of many of the other Mesoamerican peoples' art. While there are many structures that we can't understand, there were also large structures throughout the city that were obviously apartment complexes, apparently housing the members of different trades or religious groups, along with their families. Images that were clearly copied by the later Maya and Aztecs. For them, the round eyed face was Chac, the rain god. 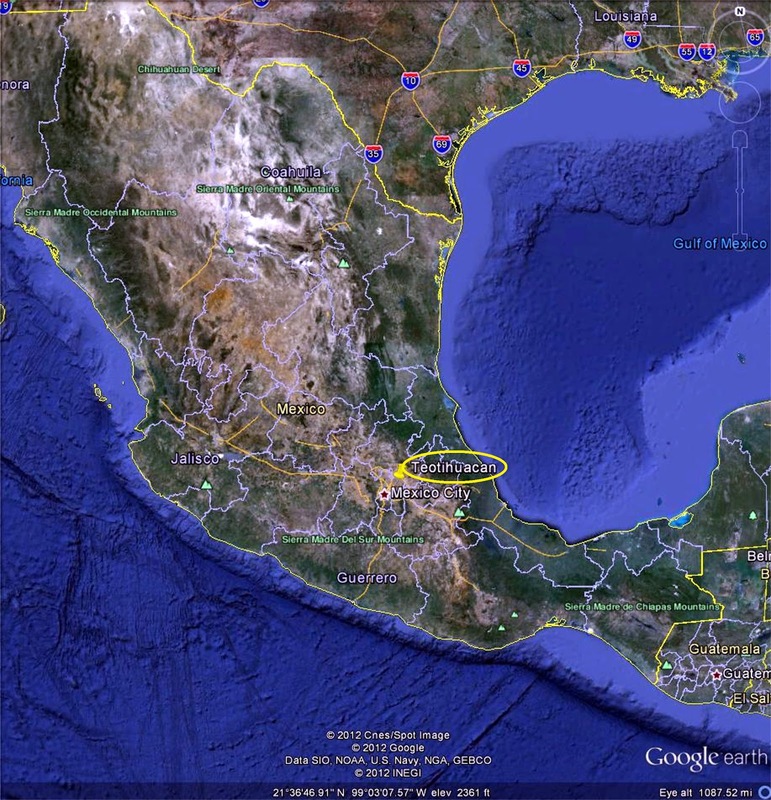 The other is Quetzalcoatl, the feathered serpent. These were two of all the Meso-american peoples' chief deities. Notice that they are both basically monsters. All this at a time when missionaries were trying to bring Christianity to the Vikings in Europe. Like the art of their successors, the artwork of the Teotihuacanos, while skillful, detailed and colorful, seems uniformly centered on monstrous images designed to invoke thoughts of fear and death. While this is all very interesting and definitely impressive, what does that have to do with our discussions? We are looking for evidence to support the indications by the Bible that man has devolved from an advanced state, sometimes clinging to vestiges of a superior culture and technology that even modern science can't encompass. Distinctive pottery of Teotihuacan - orange glazed, thin and having three legs. I'm so pleased that you've inquired! 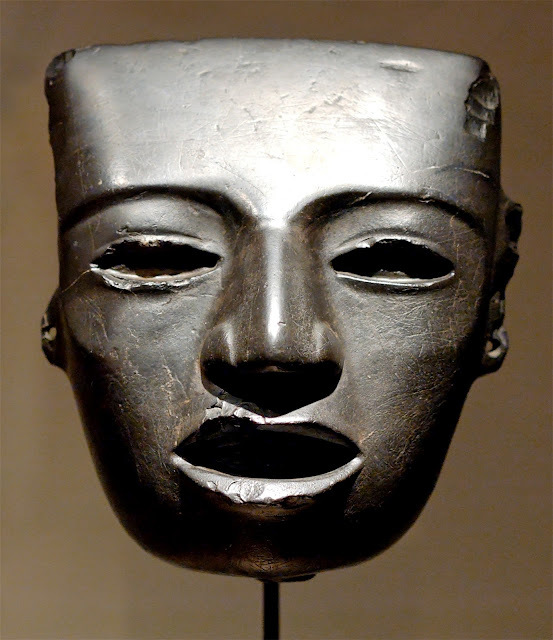 A stone mask from Teotihuacan. Again, spooky! with sheets of mica, not to mention the walks leading to the buildings along it. That would mean that the whole foundation of the Avenue alone has been covered with 691,680 square feet of mica. 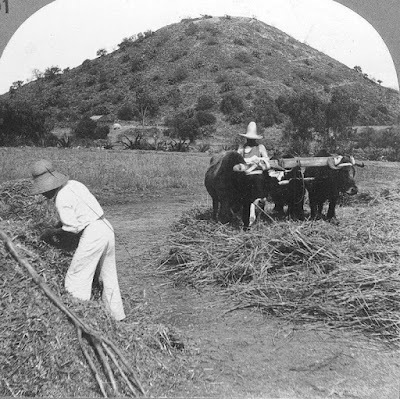 In addition, sheets of mica, measuring 90 square feet and stacked one on top of the other, were extracted from between the layers of the Pyramid of the Sun (back in 1900's, when a "restoration specialist" took unbelievable liberties with the ancient structures of Teotihuacan). The so-called Mica Temple also has massive sheets of mica sandwiched into the layers of the structure. In addition, large chambers lined with mica have been found beneath various of the buildings. Around these chambers, channels for water are situated, as though to cool the chambers. 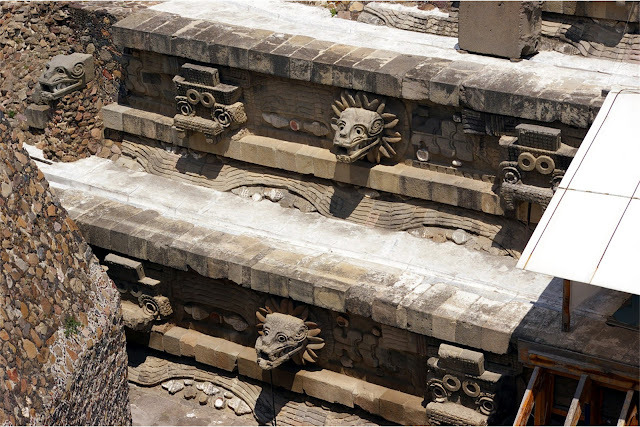 From the chambers, mica lined and box shaped channels (shaped in the same way that our current technology shapes heating and cooling ducts) run from the chambers toward the major structures in Teotihuacan. A piece of mica cut in two. 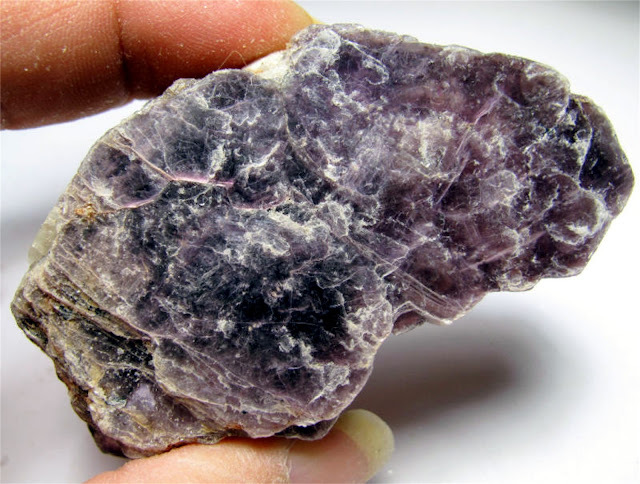 Mica is a very interesting mineral that, even in it's natural state, can be separated into thin, transparent sheets. It is highly resistant to heat, so current technology uses it anywhere that you need a transparent cover in a high heat setting. It is used for inspection windows in furnaces and to cover gauges for steam engines, furnaces or other machines that function under high heat. It is also an insulator against electricity and certain nuclear reactions. Mica cut into a sheet. Mica occurs locally, near Teotihuacan. However, the builders of the city did not use this local mica. 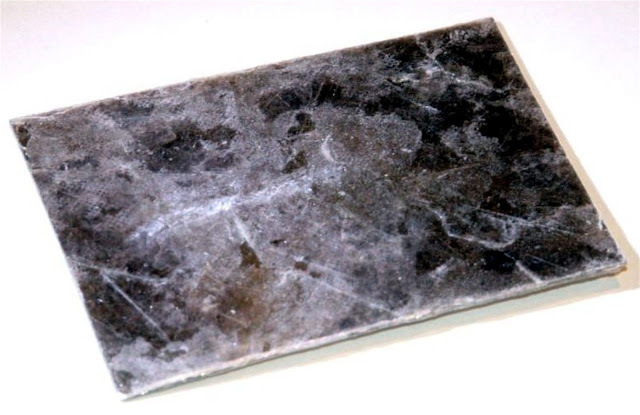 They imported mica that is readily identifiable as being unique to Brazil, over 2,000 miles away. These sheets of mica are both large and brittle, fragile in the extreme, a nightmare to move for any distance without shattering them. 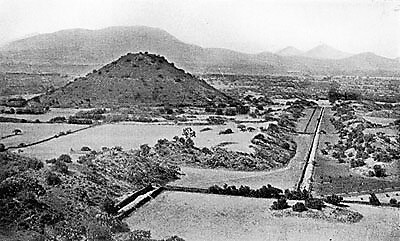 Why would the Teotihuacanos go to such tremendous effort to line the bottom of their street with a thermal, electrical and nuclear resistant material? Before you write the mica sheets off to some idea that it may have had religious significance to them, be aware that, first of all, none of the mica could be seen. It was all under the streets or within the structure of the buildings. If it had some religious significance, why bury it all? Why was it not used anywhere else, like on statues or building decorations? If our modern technology were building such structures, we would be using them to insulate or channel something of high energy. Channels for highly heated air or electrical connections come to mind, but there are probably numerous other applications. More and more secrets of the city are being uncovered all the time. The government of Mexico has been devoting enormous amounts of money and skilled labor assisting the archaeological investigations at Teotihuacan. In the process, they have uncovered underground tunnels running under some of the major buildings. These tunnels had been filled in with an enormous amount of debris. In one area, a large chamber was discovered. Within this chamber had been scattered hundreds of spheres, three to six inches in diameter. 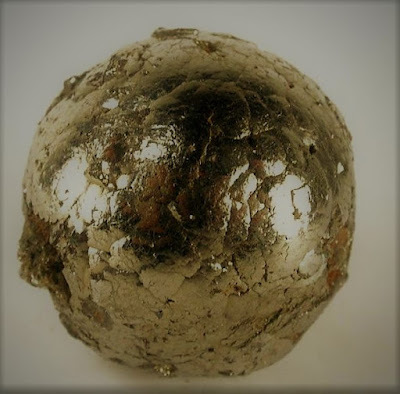 Each of these balls had been covered with iron pyrite, also known as "fool's gold." Upon examining the spheres, it was determined that the balls were composed mostly of clay. However, there was some form of organic material also enclosed in the ball, which could not be identified! The chamber holding the spheres also has iron pyrite particles spread all over the walls. Shining a light in the chamber produces an effect like a starry night. No possible use for the room has been proposed by anyone as of this writing. In addition, beneath the temple of Quetzalcoatl (the feathered serpent god) a chamber has been found that is filled with a pool of liquid mercury. This raises several questions relevant to our discussions. Because it bonds easily with other materials, mercury rarely appears in its pure form naturally. It must be extracted from its native ore, cinnabar, by a complex process, both mechanical and chemical, involving heat above 675 degrees. This would be the only way to obtain such a large amount of free mercury. In addition, mercury is highly toxic. Handling it at all without special protection would surely produce illness and, eventually, death. Why would the Teotihuacanos need such a large amount of a substance that is both difficult to produce and toxic to handle? Other than certain technological uses (refining silver and gold, producing caustic soda and chlorine and manufacturing electronic devices, like mercury vapor and fluorescent lamps), there is no real practical use for mercury. High technology from a lost, mysterious people forgotten in time? Echoes of the Antediluvian age? You might want to read the first entry posted on this blog (Past Remembering: Thoughts toward a coherent view of our ancient past, our present and our future) in order to understand my theoretical and theological underpinnings more clearly.